Mystri Gold Beaded Liners. Our premium liners are protected from pool chemicals and the sun�s damaging U.V. rays. Our liners will last longer and maintain their beautiful appearance for years. 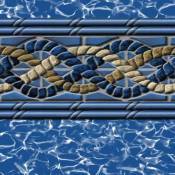 Beaded Liners are made with a special bead at the top of the liner which snaps into a channel (Bead Receiver) at the top of the pool wall. This liner can be used to replace other beaded liners without additional equipment. This liner can replace an overlap or a hung liner with the addition of a bead receiver kit. This liner is available in a 48 inch or 52 inch wall height. This pattern has been discontinued and no longer available.